Contrary to popular belief, you are are not what you eat. And on that note, the Food & Drug Administration (FDA) would really like you to stop ingesting glitter. For one, it will not make you sparkle. For two, it's simply not food -- ergo your internal organs are not thrilled about it. And if you thought this fell in the realm of basic human logic, think again. 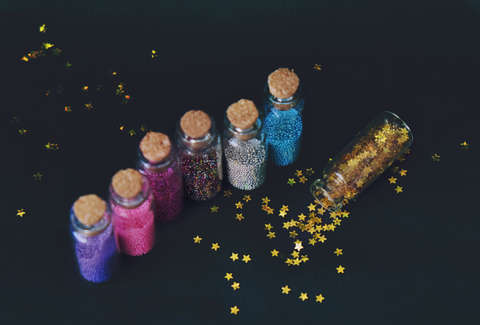 Apparently, there's been a spike in regular glitter consumption and the FDA is a little worried. On Friday morning, the government agency put out a consumer update reminding you that maybe you should stop eating crafting supplies. The advice came paired with a short video, circling in on an admittedly delicious looking sparkly cake. As alluring as the shiny pink thing is, don't be fooled. It's dangerous -- a well-disguised toxin. Silent but deadly, if you will. "Pretty -- but unsafe to eat," the video warns, zooming in on the cake. The same can be said about most precious jewels, and well-proportioned human beings. Amazingly enough, this is not the first time the FDA has felt the need to remind the general public that they should really go easy on the glitter. Back in November, the administration put out a warning about the trend, reiterating a PSA they'd issued in 2016 that claimed even though flashy TV show chefs were using the stuff, us plebes should not try it at home. If glitter-consumption is truly important to you for whatever reason, there are, in fact, some sparkly products that are safe to eat. According to the FDA, folks should check labels for ingredients like sugar, acacia (gum arabic), maltodextrin, cornstarch, and color additives approved for food use. Glitters that don't list ingredients, or that you've located, say, next to cans of lead paint in an art supplies store are probably not a good choice. Either way, we are of the humble opinion that you should just not bedazzle your baked goods.